Swinging Yiddish theatre songs, traditional and original klezmer tunes, and soulful melodies from this energetic young eight-piece ensemble. 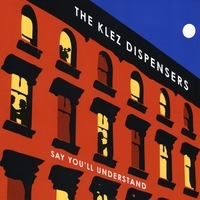 Featuring that powerful combination of youthful exuberance, expert musicianship and superb arranging for which the award-winning Klez Dispensers are known, their third CD, Say You’ll Understand, is a clever excursion through a variety of styles, both jazz and Jewish, that results in a phenomenal party record. This eight-piece big band of young jazz and klezmer hotshots dispenses virtuosic musicianship and lush, swinging arrangements of mid-20th century klezmer and Yiddish classics, as well as their own stirring original compositions. While powerfully evoking the golden age of American-Yiddish swing, the group simultaneously blazes new trails in contemporary klezmer-jazz crossover. Featuring Susan Watts (vocals, trumpet), Alex Kontorovich (clarinet, saxophone), Ben Holmes (trumpet), Audrey Welber (saxophones), Amy Zakar (violin), Adrian Banner (piano), Heather Versace (bass), and Gregg Mervine (drums), this ensemble is a fresh and exciting blend of old world sounds and cool, downtown sensibilities. Produced by Anthony Branker, the director of the Princeton University Jazz Ensemble, where many members of the group first met, Say You’ll Understand is the jazziest delicacy yet dispensed by klezmer’s favorite party band. The Klez Dispensers perform throughout the year at festivals such as the Montreal Jazz Festival and venues such as the Royal National Theatre in London, among many others. In 2000 the ensemble recorded its first CD, Indispensable, and in 2004 released its second album, New Jersey Freylekhs, which won the 2006 Just Plain Folks Music Award for Best Klezmer Album.